The tourist attractions around Trapani are among Sicily's most varied, from ancient Punic settlements and Greek temples to a breathtaking gorge and a whole city of modern art. Selinunte's acropolis and eight Greek temples dating from the sixth and fifth centuries BC comprise one of Sicily's important historical sites, and even older are the remains of the Punic city of Mozia, founded in the eighth century BC. At ancient Segesta are a temple and theater. 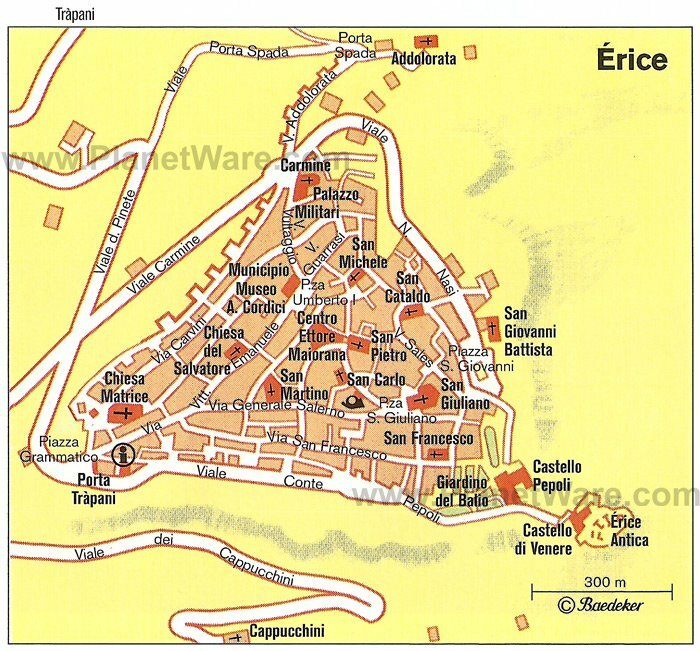 The historic towns that lie among these sights, like Érice and the old port of Mazara del Vallo, have attractions of their own - atmospheric narrow streets, beautiful churches, and seaside or mountain settings, while surprising Gibellina is an entire city of modern art masterpieces. 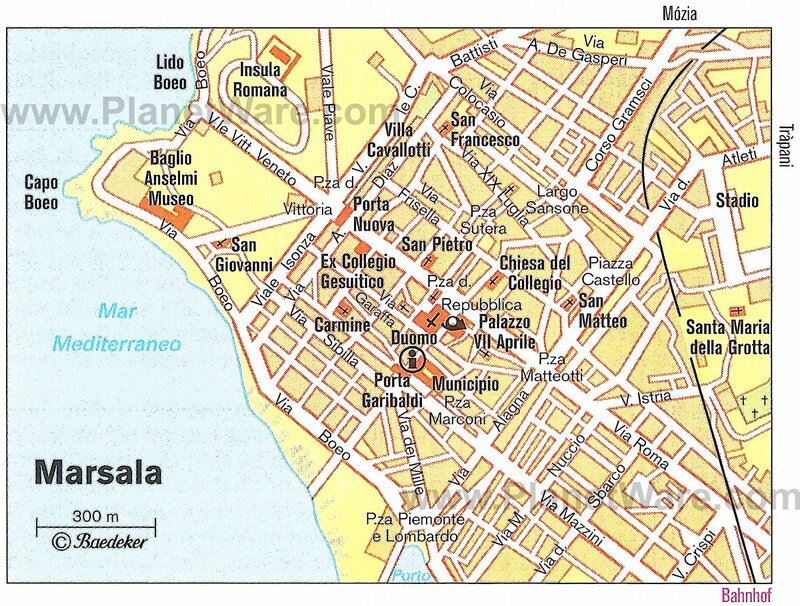 Be sure to allow time to explore these scenic hills and shores of western Sicily. 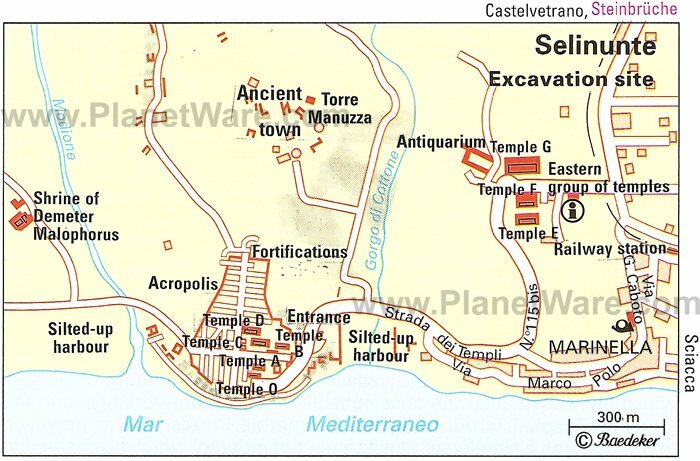 With its eight Greek temples dating from the sixth and fifth centuries BC and the nearby Temple of Demeter, Selinunte is one of the largest and most important ancient sites in Sicily. 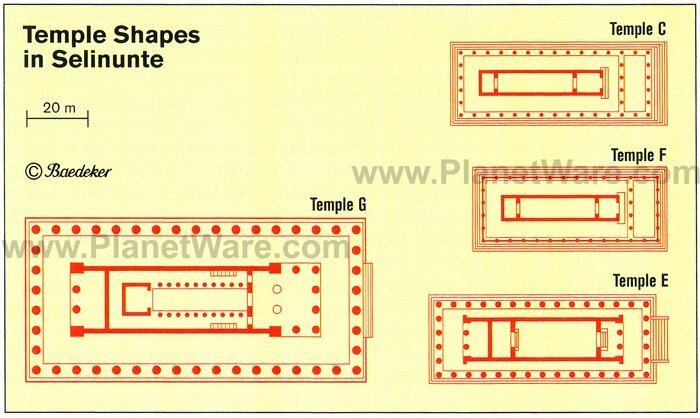 The temples in the Eastern Group are particularly noteworthy: Temple G is impressive for its massive size and the reconstructed Temple E illustrates the grandeur of ancient Greek architecture. The exceptionally good carvings that were on the frieze panels of Temple E are now safely housed in the Archeological Museum in Palermo. Built between 465 and 450 BC, this temple dedicated to Hera is considered by historians to show the zenith of Classical art. Temple G, which an inscription shows was dedicated to Apollo, is today a giant heap of rubble, a mountain of columns, capitals, and entablature fragments. There are future plans for its reconstruction, but you can still imagine how massive it must have been, even in its present chaotic state. Its base measured 50.07 by 110.12 meters, and it was about 30 meters high. Together with those at Samos, Ephesus, and Didym, it ranks with the largest of all Greek temples. Because it took a long time to build, Classical influences caused some changes while it was in progress. So the columns erected in the sixth century on the east, north, and half of the south sides are more slender, tapering towards the top, and carry Archaic capitals, while those on the remainder of the south side are transitional in form, and those on the west have stocky shafts and capitals in the strict Classical form. Only some of the columns are fluted and it is known that this was done only after they had been erected - an indication that Temple G was not yet completed when Selinunte was destroyed by the Carthaginians and thus suffered the fate of all temples of such giant proportions. Some distance from the Eastern Temples at Selinunte, the Acropolis covers 17 hectares and is ringed by a defensive wall. The eastern part of the wall dates from soon after Selinunte's founding in the seventh-sixth centuries BC, and the western part dates from the Carthaginian period, after 409 BC. The southeastern part of the Acropolis is taken up with the temples, and your eye will be immediately drawn to the massive row of columns on Temple C, the oldest and largest of them. Built around 550 BC on the highest piece of ground, its base measures 23.94 by 63.72 meters and has a periphery of columns that are 8.43 meters tall. The earliest columns are monolithic in construction, the later ones formed from stacked sections. A huge Gorgon's head painted in garish colors dominates the east tympanum (you may have seen the reconstruction of it in the museum in Palermo). More ancient sites are all around to explore: temples, sanctuaries, walls, quarries, and shrines. In a lonely spot in the hills lie the as yet unexcavated ruins of the ancient Greek town of Segesta with its incomplete temple and theater. The temple crowns a hill surrounded on three sides by a gorge and was probably begun about 426 BC. On a base measuring 23.12 by 58.35 meters are six columns at each end and 14 along the sides. Two of them were pushed over at some time but re-erected in the 18th century, so that the whole is preserved, complete with tympana and entablature. As the building was never completed, the columns are not fluted, the capitals only roughly carved, and you can still see the lifting bosses. 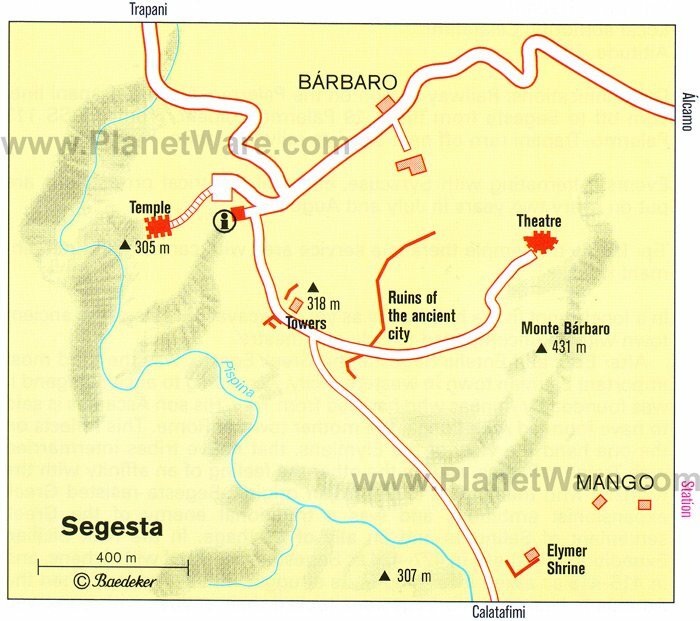 The second important sight at Segesta is the theater, above in a natural hollow on the hillside. It was laid out in the third or second centuries BC and rebuilt by the Romans about 100 BC, with some changes to the stage. The semi-circular seating area is carved out of the rock, its 20 rows of seats forming seven wedges separated by steps. Only the foundations of the Roman stage have survived, so unlike ancient visitors, you can see as far as Monte Erica and Castellammare del Golfo, once the port of Segesta. The Cathedral of Santissimo Salvatore is a cross-shaped basilica with three aisles divided by columns, built under the Normans in 1086, shortly after the conquest of the town by Roger I. It was restored in the Baroque style from 1696 onwards, using the original ground-plan, and in 1906, it was given a new façade. Remains of the original exterior can be seen in the east apse. The clear proportions and fine painting in the interior are impressive. Dominating the chancel is a sculptural group, The Transfiguration of Christ on Mount Tabor, by either Antonello Gagini or his son Antonino, in 1537. Look in the northwest corner for a sarcophagus similar to that of Frederick II in Palermo, although it is not in the imperial purple porphyry, but in green marble. In the apse chapel in the north transept is a 3.15-meter-high painted wooden crucifix, which was made soon after 1200 and is probably the oldest of many painted crucifixes found in Sicily. The west part of the building and the dome, which dates from the later restoration, dominate Piazza della Repubblica, which is surrounded by several other Baroque facades and the 1771 Fountain of San Vito by Ignazio Marabitti. You'll find several other interesting churches and the gate of the Palace of the Maltese Knights if you explore the streets around the harbor in this old port town. On the small island of San Pantaleo, reached by boat from Contrada Spagnola, near Marsala, are the remains of the Punic city of Mozia. It was founded in the eighth century BC and destroyed in 397 BC. The position of this tiny island in the middle of a lagoon, protected from the open sea, made it possible for a Phoenician settlement to exist here as long ago as the eighth century BC. When the great Phoenician/Punic power, Carthage, had to retreat from Greek colonizing forces, this became one of its bases in Sicily. It declined after the early fourth century BC, and today this is the only place in Sicily where you can see remains from the Carthaginian period. You'll find substantial parts of the 2,500-meter town wall with its 20 towers and bastions, as well as the Casa dei Mosaici, which was built after the destruction of 397 BC and has early Hellenic black and white pebble mosaics from about 300 BC. On the west coast are two necropoli with the small stone graves used for ash urns and a Tophet with the remains of a small temple to Baal. To the north, substantial remains of foundations and rectangular walls of a monumental temple to the goddess Tanit have been preserved, as well as individual mosaics. While most of the best finds are in the museums in Palermo or Marsala, the on-site museum has an important marble statue, a larger-than-life image of a young man. The unusual work is made of Greek marble and created in the second quarter of the fifth century, probably by a Greek sculptor for a Carthaginian client. So badly was Gibellina destroyed by an earthquake in 1968 that residents decided to build a new town of Gibellina Nuova, 20 kilometers to the west, and invited prominent Italian architects, sculptors, and painters -- Vittorio Gregotti, Alessandro Mendini, Renato Guttuso, Pietro Consagra, Alberto Burri, Mimmo Rotella, and Andrea Cascella - along with foreign artists to create it. From their plans developed a controversial drawing-board town, its character created by modern architecture and sculpture, which many people accuse of having very little in common with Sicily, the landscape, or the local way of life. But there is no denying that Gibellina is a memorable and fascinating place to see. You will enter by the gigantic Porta di Ferro, Gate of Steel, designed by Pietro Consagra. In the Museo Civico d'Arte Contemporanea are works by many contemporary artists, including an impressive memorial to the earthquake by Francesco Venezia. The rubble of the old town of Gibellina was buried by the sculptor Alberto Burri under white cement, with pathways that follow the streets of the former village, a thought-provoking memorial known as Il Cretto. Perched at a 751-meter altitude, Érice towers over large parts of Western Sicily. Go there for its superb views and its atmospheric medieval townscape of narrow little streets that wind between densely packed houses. The town wall dates from about 1000 BC, built by the Phoenicians and later restored by the Carthaginians. It bounds one side of the town's triangular perimeter, which is scarcely one kilometer on any side. The most important building is the Chiesa Matrice, whose façade is highlighted by a beautiful rose window. It was built in 1314 using stone taken from ancient buildings; its campanile had been erected in 1312 as a defensive tower. In 1426, a Gothic portico was added to the façade. Inside, look for the 1469 statue The Mother of God, thought to be the work of Francesco Laurana, as well as the marble altar piece created by Giuliano Mancino in 1533. At one corner of town, through a luxuriant green park, you'll come to the medieval Castello Pepoli, on the site of the ancient acropolis, and beyond it on the site of the Temple of Aphrodite, to Castello di Venere, dating from the 12th to the 13th centuries. The views are spectacular. The church of San Giovanni Battista preserves the Gothic-Norman east gate of the original building, and inside, 15th- and 16th-century works including some by Antonello Gagini and Antonio Gagini. Also from the Gothic era is the church of San Martino, dating from 1339. The Museo Comunale contains local Neolithic, Punic, Greek, and Roman finds, including a fine head of Aphrodite from the fourth century BC, as well as jewelry, bronze statues, terracotta, and marble sculptures, including Antonello Gagini's Annunziata. The lively town on the west coast owes its foundation to the Carthaginians, its name to the Arabs, and its reputation for patriotism to Garibaldi, who began his campaign against the Bourbon rulers by landing there in 1860. The Cathedral of San Tomaso is a columned basilica of Norman origin, completely renewed in the 18th century. It is rich in works by the 16th-century Gagini family of artists: Assunta by Antonino Gagini in the second right side-chapel; Madonna dell'Itria, also by Antonino, in the fourth right side chapel; Madonna del Popolo by Domenico in the right-hand transept apse; and a large altar retable by Antonello and his son Gian Domenico, completed in 1530, in the left-hand transept chapel. From the rear of the church, near the main apse, enter the museum to see the series of eight large Flemish tapestries from Brussels that were formerly in the church. These sumptuous tapestries were given by King Philip II of Spain to Archbishop Antonio Lombardo of Messina, who was born in Marsala and who left them to the city. The Museo Nazionale Lilibeo is a modern facility with contemporary displays covering prehistory to the Norman period. These include Punic burial monuments, ceramics, Roman architectural remains, and a mosaic floor. The outstanding treasure here is a three-meter-long Punic ship dating from the third century BC, with photos of the recovery and finds. Rocche di Cusa or Cave di Campobello is the ancient quarry of Selinunte, 11 kilometers southwest of Castelvetrano. Here, the stones for the buildings of Selinunte were hewn until operations ceased when Selinunte was destroyed by Carthaginians in 409 BC. Since then, fragments have lain scattered across the site at all stages of production, from column bases just hacked out of the rock to others almost ready to be transported the 10 kilometers to Selinunte. This was the source of the enormous blocks, column bases, and capitals of Temple G, the weights of which could be as much as 100 tons. This quarry gives an insight into the ancient technical skills of quarrying, working, and transporting heavy loads. Above Lago della Trinità, four kilometers west of Castelvetrano, the Chiesa di Santissima Trinità di Delia is on the estate of the Saporito family, and used by them as a burial chapel. The church was constructed between 1140 and 1160, probably as a place of worship of the Basilian order. This seems likely because the church, with its small square central building, is a cross-domed church in the Byzantine style. The central dome rests on four pillars, two of marble and two of red granite; the east end has three semi-circular apses. The interior, restored in 1880, has impressive stone carving in the capitals, and gives an exceptional view of the construction of the vaulting and domes. Because the stonework is not covered in stucco or decorations of any sort, the details of each block are clearly visible. The almost severe blocky structure is lightened by delicate details - the intricate window tracery and finely worked bosses on the doors - that betray its Arab influences. This combination of Norman, Byzantine, and Arabic is unique to Sicily. The church stands in a remote setting, surrounded by trees, including some rare palms.